Love Kat and Tyrus. So much fun. Enjoy the banter. Good chem. Amazing Podcast.. I love it well worth it to listen. Kat identifies as a 59-year-old "weathered soul," Tyrus suggests changing mascots for the podcast and more! This week's episode took a weird turn. Listen and find out why! Tyrus gets Knighted in the name of fashion, becoming Sir Tyrus. Tyrus and Kat listen to music for mosquitoes and more! Tyrus and Kat figure out a way to get more free time on the show, Kat continues her streak of athletic feats and more! Tyrus explains what he would do in a zombie apocalypse, find out who Tyrus and Kat are blaming for studio vandalism and more! Tyrus, Kat and their team of Pterodactyl warriors run through some of the weirder stories of the last week. Plus Aron checks in from the road and Nora reads the latest dog poem. Tyrus and Kat welcome special guest, former WWE Damien Sandow aka Aron Stevens, Kat’s got the sniffles again and more! This week, Tyrus wants Kat to become a competitive eater, Tyrus discusses his new retirement plan and more! Tyrus and Kat welcomes special guest Dr. Drew and he helps Tyrus with “new” Kat and more! Tyrus and Kat reveal the results of the pterodactyl drawing contest, Kat recieves a special delivery during the podcast and more! 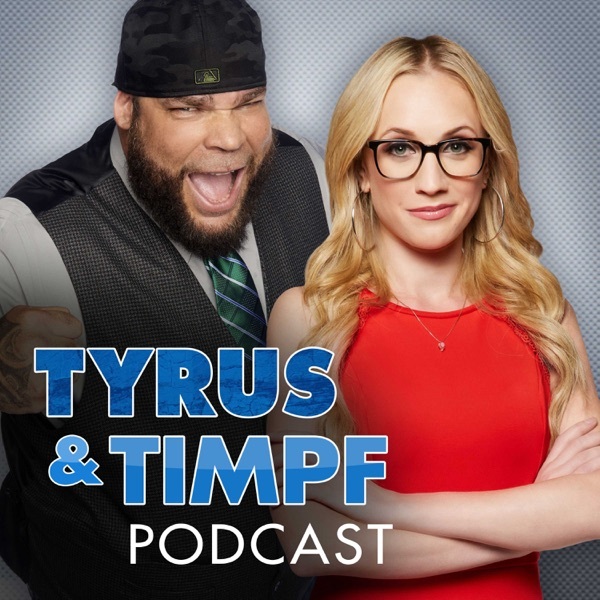 Special BONUS episode of Tyrus and Timpf on Valentines Day! Tyrus and Kat discuss a crime of fashion, Tyrus thinks he's becoming more Libertarian thanks to Kat's influence, and they make the pterodactyl the official mascot of the podcast. Tyrus and Kat debate who is more patriotic, they welcome special guest Nicole Arbour and more! Tyrus and Kat can't believe there's such thing as an "emotional support alligator", Kat explains her "sick" new business venture and more! Tyrus and Kat discuss her new GoFundMe idea, Tyrus talks about his Instagram Op-Ed and more! Tyrus explains how a craving for bloomin' onion landed one woman in jail, Tyrus and Kat layout the criteria for participating in their dating show and more! Kat explains why her phone makes for a great best friend, Tyrus shares his friendly sports rivalry with his old boss, Snoop Dogg and more! Tyrus devises a strategy to help Kat get more Instagram followers, Kat shares texts from a disastrous date and more! Tyrus and Kat welcome special guest and Kat's best friend, Digital Strategist at GQ Magazine Joel Pavelski, Tyrus explains why he relates to the Grinch and more! Tyrus and Kat debate which is better, real or fake Christmas trees? Kat shares why she would never date the ghost of 300-year-old pirate and more! Tyrus asks Kat to share her own version of "Anti-Animal Language," Kat invites another criminal onto her "All-Star" panel, Tyrus reveals he is going back to school to become a French Fry expert and more! Tyrus and Kat discuss what they love and hate about New York City.